Parvanov, P. (2018) “Book review: Leszek Gardeła. 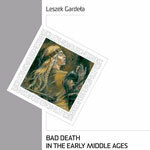 Bad Death in the Early Middle Ages. Atypical Burials from Poland in a Comparative Perspective. Rzeszów: Instytut Archeologii UR, 2017. Collectio Archaeologica Ressoviensis 36, 288 pages., ISBN 9788365627162”, Bulgarian e-Journal of Archaeology / Българско е-Списание за Археология, 8(1), pp. 91-94. Available at: http://www.be-ja.org/index.php/Be-JA/article/view/167 (Accessed: 23April2019).